In the early 1970s, pioneer West Coast modernist Gordon Smith was transitioning from hard-edge abstraction back into landscape. 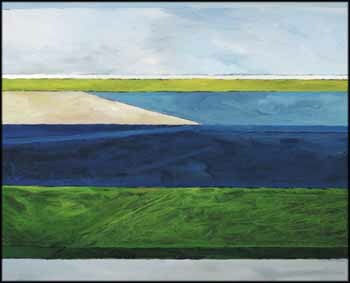 While working his way through this change, he was influenced by the paintings of American Abstract Expressionist artist Richard Diebenkorn, whose landscapes were divided into loose geometric planes, such as in his Ocean Park series. Smith's work evolved into a series of semi-abstracted landscapes characterized by grid-like colour bands put down with brushy paint work. Smith glazed his pigments in layers, allowing the underpaint to show through, creating a rich surface. In response to Smith's 1973 Bau-Xi Gallery exhibition in Vancouver, critic Joan Lowndes described works from this period as "tenderly lyrical, semi-abstract versions of the sea and shore of West Vancouver." Sand Heads, with its planes of glowing green and rich cobalt contrasting with pale sand and its delicate atmospheres of a partially clouded pale blue sky, is an outstanding example of this period of his work, in which he explored the vital relationship between colour and form.